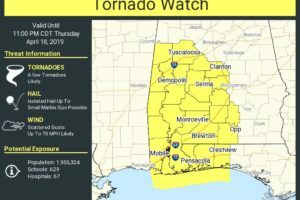 NWS Birmingham has extended the Tornado Watch to include Blount, Fayette, Marion, St. Clair, Talladega, Walker, Winston counties until 11:00 pm CDT tonight. Strong winds will continue after this line of storms passes. Be alert for damaging winds both ahead of and behind the line. 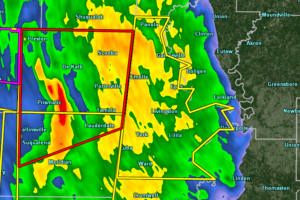 There is still a threat of spin-up tornadoes, especially over Fayette, Walker, and Jefferson Counties. 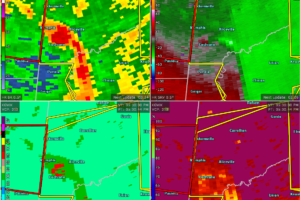 The strongest segment of the line of storms is now stretching from the northeastern corner of Tuscaloosa County and stretching to the south through Brookwood and Vance, then down into Heiberger and Marion in Perry County, and down into the eastern parts of Marengo County. 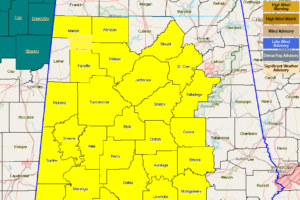 The Tornado Watch in effect until 11:00 pm for portions of Central Alabama has been extended to include Coosa, Elmore, Jefferson, Montgomery, Pike, and Shelby counties. 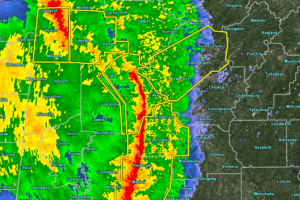 A strong line of storms continues to move into the western parts of Central Alabama with a bowing segment moving through the western portions of Tuscaloosa and Hale counties. 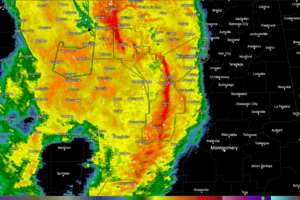 Winds in that part of the line could reach as high as 70 MPH. The line is moving to the east at 45 MPH. Some rotation has shown up in the last couple of scans over the Cochrane community and is heading toward the western parts of Aliceville as it moves to the north-northeast. 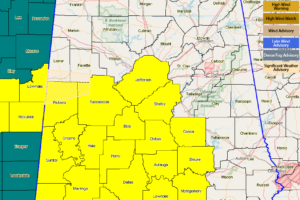 Strong storms are approaching the state line and NWS Birmingham has gone ahead and issued a Severe Thunderstorm Warning for all of Sumter County until 5:30 pm. 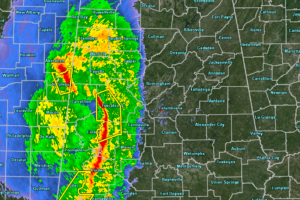 Now it’s time to watch the radar as the storms will soon begin to move into the western parts of Central Alabama. 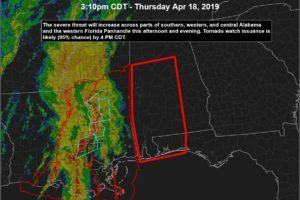 The Storm Prediction Center has issued a Tornado Watch for the west and southwestern parts of Central Alabama until 11:00 pm CDT tonight. 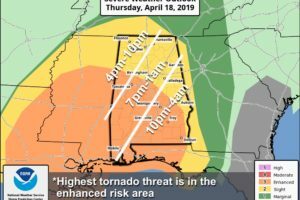 NWS Birmingham is currently on a call with the Storm Prediction Center about the issuance of a tornado watch for the western parts of the area. 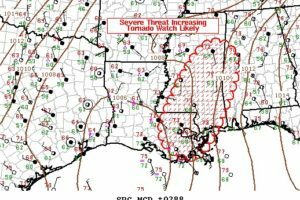 Tornado watch should be issued before 4:00 pm CDT. 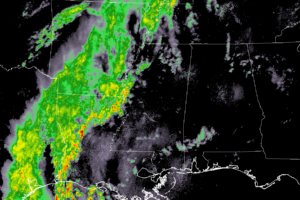 WATCHING THE RADAR: A line of severe storms is along I-55 in Mississippi as I write this update; a few tornado warnings are in effect for line segments where storms are in rotation. But, here in Alabama, all is calm… it is a warm, windy afternoon with a mix of sun and clouds with temperatures in the 76-80 degree range. 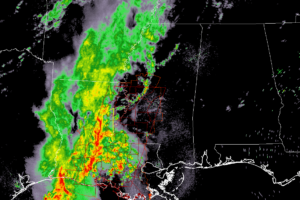 A line of strong to severe storms are moving through the west and southwestern parts of Mississippi and down into the eastern half of Louisiana, which has needed a few Tornado Warnings and Severe Thunderstorm Warnings within the past several minutes. 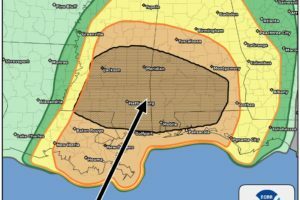 The Storm Prediction Center has released a new mesoscale discussion which states that a new tornado watch is likely to be issued for the southern and eastern parts of Mississippi and the southwestern parts of Alabama which may include a couple of counties in Central Alabama. At 11:50 am, we are still free from any shower activity across Central Alabama, but there is some decent sunshine making it to the surface out there. At 9:20 am, radar is quiet across Central Alabama so far this morning and it should stay that way for a good while throughout the morning and into the afternoon hours. 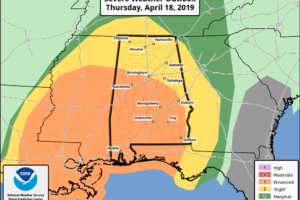 SEVERE STORMS POSSIBLE TONIGHT: Another dynamic storm system will impact Alabama over the next 24 hours, but the day today should be fairly quiet. The sky will be mostly cloudy, and temperatures will rise to near 80 degrees this afternoon. As the pressure gradient tightens, south winds will ramp up this afternoon, averaging 15-25 mph with higher gusts. Any showers today should be very widely spaced.